Some of us complain about winter incessantly—the cold temperatures, the tricky driving conditions, and all the time we’re stuck inside. Yeah, summer gets all the glory. And it’s true that winter can be dangerous. But it can also be hauntingly beautiful. Various kinds of snow and ice carpet the landscape during this time of year. Yet, some kinds of snow are a lot stranger than others. 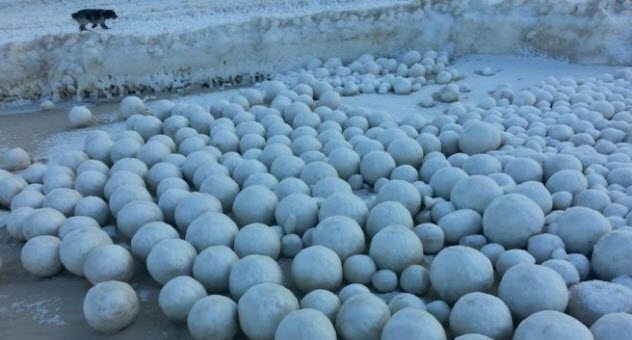 From mysterious balls of ice washing up on a beach in Siberia to icicles that form miles beneath the ocean, these phenomena are far from ordinary. Pastel-colored and floating eerily off the ground, these columns of light have often been mistaken for UFOs. Those who catch sight of them on a freezing winter night are often awed by their beauty, which seems like the work of aliens or some otherworldly power. Yet, the science behind the existence of light pillars is relatively mundane. “Like all halos, they are purely the collected light beams from all the millions of [ice] crystals, which just happen to be reflecting light toward your eyes or camera,” explains Les Cowley, a retired physicist and atmospheric optics expert. 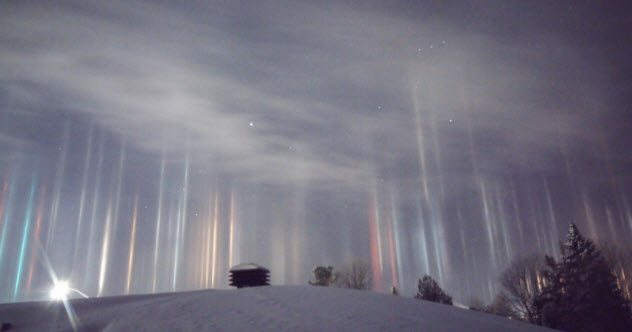 During very cold, windless nights, flat ice crystals from high altitudes can form closer to the ground and reflect the streetlights from cities and the ground lights from cars, resulting in the haunting, alien-like appearance of light pillars. They often take on the same color as the lights they reflect, which explains their many-colored hue. Interestingly enough, similar phenomena can occur when sunlight or moonlight reflects off the ice crystals, resulting in the formation of sun and moon pillars. These strange formations of snow resemble lethal patches of spikes. In fact, some of them can reach much higher than a person’s shoulder—up to 6 meters (20 ft)! Without any other traces of snow around penitentes, it can be startling to see these clawlike blades rising from the ground like hooded figures. 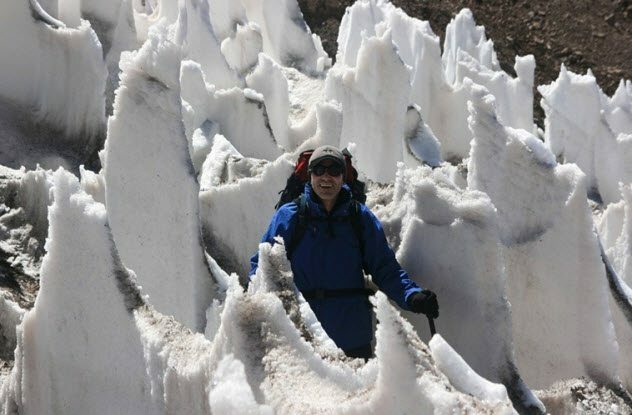 Penitentes are formed from hardened snow or ice at altitudes above 4,000 meters (13,000 ft). They can be found in shallow valleys where the snow is deepest and the Sun’s rays are not too strong. Due to the process of sublimation (when the snow directly evaporates without becoming liquid), the snow becomes dented randomly as some areas sublimate faster than others, leaving deeper and deeper depressions. Over time, towering fields of spikes are formed. Don’t be fooled by their delicate appearance. While they may be pretty, they are a tricky obstacle for mountain climbers. In a remote village in Siberia in 2016, the residents were greeted with an odd assortment of objects that seemed to have been washed ashore from the inner reaches of the sea. Stretching for 18 kilometers (11 mi), giant balls of ice, some as large as 1 meter (3 ft) in diameter or as small as a tennis ball, covered the shore of the Gulf of Ob. It was as though nature was prepping for its own snowball fight. Even the village elders did not know what to make of it. Also known as ice boulders, ice balls are formed out of frazil ice (a slushy mixture of ice crystals and water). Rough waters and strong winds roll the ice over and over again to give the balls their spherical shape, which can also take on a tan color due to sand. Calmer waves result in a more flattened, pancake-like version. Unfortunately, with a weight of up to 23 kilograms (50 lb), these balls of solid ice would not make a snowball fight very enjoyable. Everyone knows what volcanoes are. Towering and awesome displays of nature’s might, these fiery vents in the Earth’s crust spew out molten lava and deadly gases. Yet, there also exists a type of volcano that erupts molten ice. Ice volcanoes (aka cryovolcanoes) are similar to regular volcanoes in that pressure builds up beneath the surface, resulting in an eruption that is either violent or flows in gentle streams. Instead of spewing fiery rock, however, the eruptions of ice volcanoes consist of frozen gases of water, ammonia, or methane. 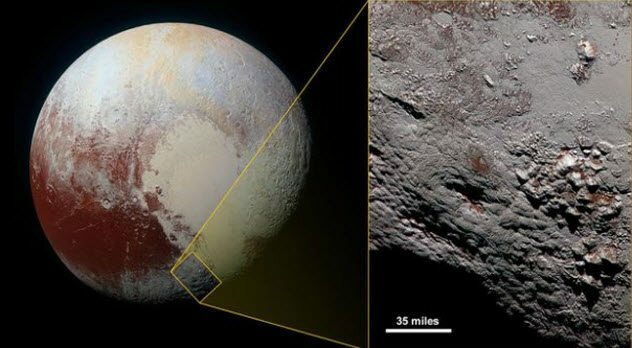 Excitement was caused by the discovery of these volcanoes on Pluto in 2016, although they have previously been documented in 1989 on Triton, Neptune’s largest moon. Cryovolcanoes can reach monstrous proportions. One of them, Pluto’s Wright Mons, reaches a staggering height of 4 kilometers (2.5 mi) and a length of 145 kilometers (90 mi). An awe-inducing word that is exactly what it sounds like, thundersnow is a phenomenon that occurs when thunder and lightning happen during a snowstorm. The conditions have to be just right for this to occur. The weather must still be cold enough to make snow, but the layer of air near the ground must be warmer than the air above it. Like a thunderstorm, warm and moist air wafts upward to create unstable air columns, which then condense into clouds. When regular snowstorm clouds develop bumps called turrets, it signifies unstable air currents that lead to precipitation such as hail and snow. As these particles collide into each other, electrical charges build up and are released in the form of lightning. Unfortunately, even if you are in the right place for this rare weather event to occur, the most you will be able to see is a flash of brightness followed by the rumble of thunder. 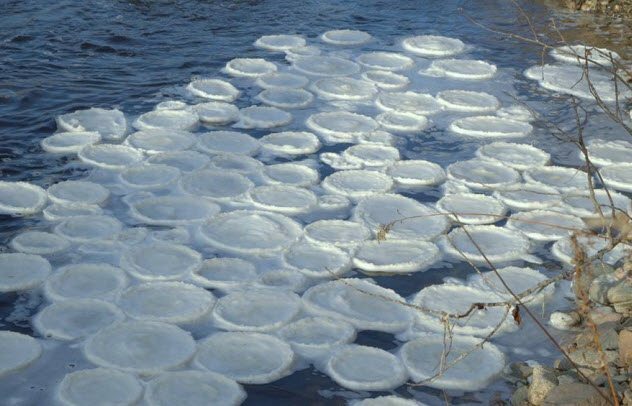 Strange, frozen lily pads dot the river, covering the water with circles that are up to 3 meters (10 ft) across. These circular slabs resemble peculiar Frisbees or pizzas, yet they are made up of ice that can be up to 10 centimeters (4 in) thick. When slush accumulates on a calm water’s surface in below-freezing temperatures, the slabs of ice are bumped or splashed into each other to create the circular shapes with the raised edges around them. In a more turbulent ocean, the slabs of pancake ice are pushed over each other, eventually freezing into a solid sheet of ice. These formations are beautiful yet eerie to behold. While most commonly found in Antarctica, they can appear anywhere if the conditions are right. 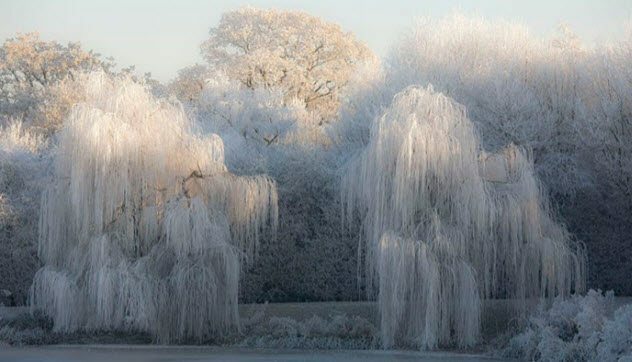 The Old English dictionary definition of “hoarfrost” is “expressing the resemblance of white feathers of frost to an old man’s beard.” The feathery substance can be seen covering trees, leaves, and bushes with a fine layer of ice crystals on a frosty day, giving the appearance of a winter wonderland. Hoarfrost is created in a similar way to dew. When water vapor molecules come in contact with a grass blade or other object in below-freezing temperatures, deposition occurs. Deposition (when the gas state leads directly to the solid state) results in the covering of feathery ice crystals. The more moisture in the air, the thicker the coating as the frost forms bigger and more complex patterns. As the days grow shorter and temperatures plummet to below freezing, a variety of animals have adaptations that help them survive the oncoming winter. While bears sleep and geese fly south, the wood frog has a disturbing, uncanny strategy: It simply allows itself to freeze solid. 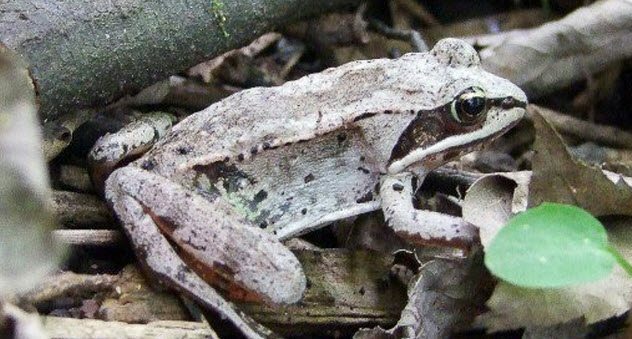 Unlike most frogs, which insulate themselves in the mud beneath lakes, wood frogs burrow into land. The leaf litter provides little warmth, and the frogs’ bodies soon shut down entirely. The heart ceases to beat, the organs stop functioning, and the blood freezes. In other organisms, freezing damages tissues by rupturing the cells’ delicate structures with ice crystals. The cells become dehydrated and are no longer able to function. The wood frog avoids this life-threatening dilemma by producing large amounts of glucose and transporting it into its cells to effectively act as antifreeze. Urea levels also rise, which adds more protection. While the cells themselves are not frozen, the water does freeze in the skin, eyes, and muscles and the abdominal cavity surrounding certain organs, making the frog as solid as a block. When spring comes, the animal thaws from the inside out. The heart and lungs begin to function again, and the frog hops away as though nothing has happened. It looks as though a giant hand has reached down and torn a patch of the clouds away, leaving a gaping wound in the middle of the sky. Is it an act of God? Aliens? Or a bizarre cloud formation? Skypunches (aka fallstreak holes) occur when the weather conditions align perfectly. The water droplets in clouds must be at a temperature below zero but not cold enough to make snow. The cloud droplets do not freeze normally. Instead, they stay in position as supercooled water droplets. Eventually, some of them turn into ice and start a chain reaction of the rest of the vapor freezing as well. 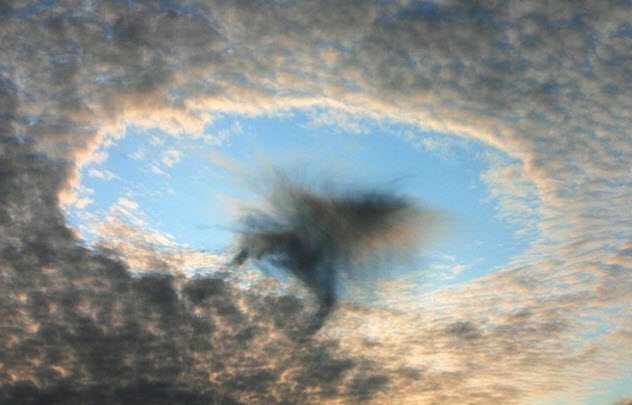 The vapor that does not turn into ice evaporates, resulting in a hole in the cloud. Research has confirmed that passing aircraft are responsible for starting the freezing process. When airplanes fly through the cloud, the air cools as it passes through the plane’s wings and propellers. The cooling is enough for the droplets to freeze. Although skypunches appear to be the majestic work of a giant reaching through the clouds, it is merely the work of humans after all. Forget about icicles. Brinicles form on the ocean floor and are just as deadly as they are fascinating. Sea ice forms in the frosty conditions of the Arctic and Antarctica. Salt leaks out of the ice, which increases the salinity of water and lowers its freezing point. Density also increases. The salty brine is prevented from turning into ice and sinks into the much warmer areas further down in the ocean, causing the surrounding water to freeze and form a brinicle. When the giant blue tentacle twists downward to touch the seafloor, a patch of ice instantly blooms and freezes (i.e., kills) everything it touches. “They look like upside-down cacti that are blown from glass, like something from Dr. Suess’s imagination. They’re incredibly delicate and can break with only the slightest touch,” says Andrew Thurber, a professor at Oregon State University. And yet, the deadly pillars can yield the secrets to life as well. These components may also contain the ingredients needed to make DNA. Read more about amazing and unusual weather phenomena on 20 Amazing And Unusual Weather Phenomena and Top 10 Extreme Weather Anomalies.